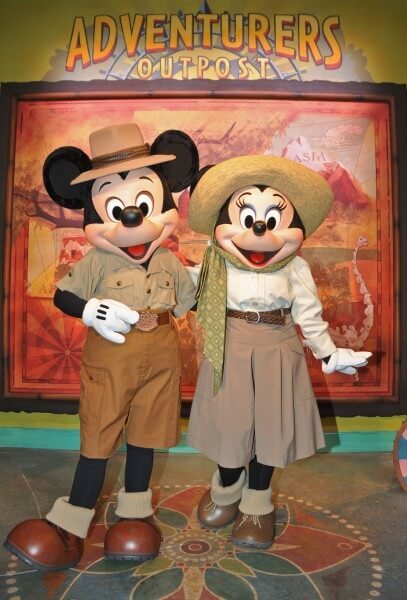 Today Walt Disney World officially opened a new meet-and-greet location for Mickey Mouse and Minnie Mouse at Disney’s Animal Kingdom. It’s called Adventurers Outpost, described as a “new exploration headquarters” on the park’s Discovery Island, allowing guests to meet the famous pair in safari outfits, ready for a new adventure. Inside Adventurers Outpost, photographs from Mickey and Minnie’s travels around the world line the walls, including Nepal and Africa – other locations prominently featured within the park. But this seemingly small new experience means much more than offering guests a new photo opportunity. Disney didn’t just want to give Mickey and Minnie a new home in the park, they needed to in order to make way for Avatar. It’s been nearly two years since Disney announced the major project based on director James Cameron’s financially successful “Avatar” film and its upcoming sequels. Since then, Disney has revealed little to no details as to what will be featured within the land of Pandora when it opens at Disney’s Animal Kingdom in the coming years. Though even the location of Avatar land hasn’t been announced, it’s widely reported that it will replace the park’s Camp Minnie-Mickey area – the previous home of Mickey and Minnie meet-and-greets. So the duo’s move to Discovery Island isn’t merely a change of scenery, but an early step in dramatically reshaping an entire park area. Beyond meet-and-greets, the only real attraction within Camp Minnie-Mickey is Festival of the Lion King, the park’s popular stage show. There are plans to relocate that to a new theater near the Harambe / Africa area of the park, with construction already having begun there two months ago. Again, Disney hasn’t officially announced this change yet. Despite the relative silence surrounding the Avatar project (a brief update was shared in December), Disney is adamant that they are still moving forward with it behind the scenes, even if the public is doubtful due to so few details being revealed. 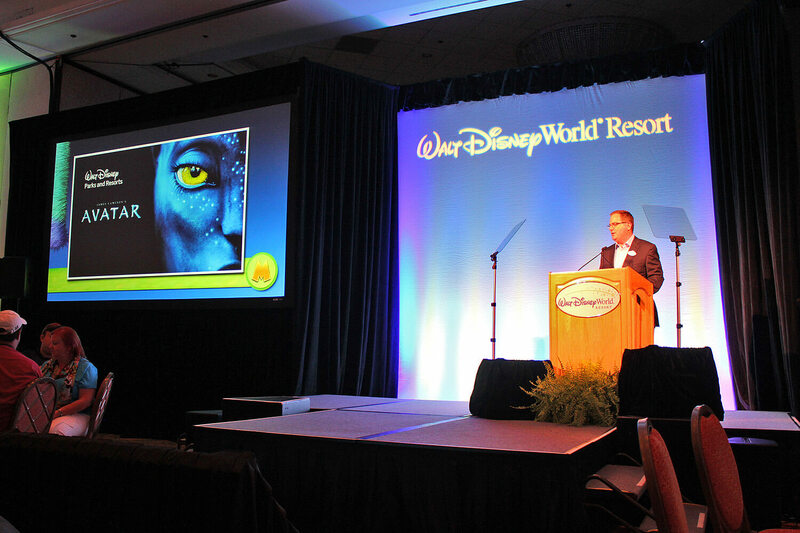 Walt Disney World President George Kalogridis talks Avatar. Kalogridis did briefly mention Avatar during his presentation at the media event, noting only that “Imagineers are hard at work on a new land” with original Animal Kingdom designer Joe Rohde at the helm, but no new details were released. The film sequel to “Avatar” was originally scheduled for release by the end of 2014, but that has since been pushed back to 2016, at least. As such, Disney is in no rush to update their own timeline for completely their Avatar-inspired theme park land, likely several years out to coincide with the future films. In the meantime, subtle changes like today’s opening of the Adventurers Outpost will mark small steps toward the opening of Pandora. Because Animal Kingdom needs something new and fresh just as much as Hollywood Studios does. It won’t surprise me if a Star Wars land happens in the future but I’m just happy that they are finally talking about building something more then themed bathrooms and DVC hotels. I just can’t see this being worth any investment. With that being said they must have something up there sleeve. I couldn’t see them continuing to move forward if they didn’t feel it would be profitable for many years to come. Only time will tell. Who knows maybe ill make it out to more than once a year when family is in town. The park needs something I just can’t say that Avatar is it. I’m looking forward to this. Imagine: you enter the land walking trough the spaceship that takes you to Pandora. To follow in the steps, I mean “wheels” of Jake Sully (yep that’s the name of the guy, I looked it up), you ride trough a faithful representation of the ugly greedy company (no not Disney) in a wheelchair. In the last scene you get the avatar and walk out of the ride onto Pandora (except for me because I’m in a wheelchair and I don’t think Disney’s magic goes as far as I would like to). There is a meet and greet with Pocahontas (story wise you won’t tell the difference) except she is blue. The other ride is a Soarin thing in 3D where you fly over the planet in different scene’s without any transitions taking you (just like the Epcot ride) out of the illusion. Huge stores try to sell you food from Pandora that looks like cones from Cars Land and blue plush aliens. It’ll have a ton of rockwork (not all of them are blue) and at night it looks like a disco waiting for a yeti to show up. WHY is the fan “Armchair Imagineer” eedidea for the attraction always The Movie Dark Ride, based on some -one- isolated scene from the movie? Why? Just help me understand that. Because fans like to think themselves at the levels of the Imagineers (I AM A GIANT SQUID OF ANGER AND JUST BECAUSE I GO TO DISNEY 3 TIMES A YEAR MEANS I KNOW MORE ABOUT DESIGNING THESE PARKS THAN THE ACTUAL PEOPLE WHO’VE STUDIED FOR THIS SORT OF THING DO GRRRRRRRR) Yet when it comes to creating new attractions, they can’t. There’s a reason they sell insurance or are accountants or whatever and not Imagineers. I say that Avatar it’s as good as any idea for Animal Kingdom. I would like to an Australia contingent but I cannot think of a ride to base it around, an outback safari perhaps. But for any property, Avatar is the best you can put in, bring people into the park and yet still hold true to theme of the park with the symbotic relationship of everyone in an environment. ^This. I don’t HATE the idea of Avatar Land, but I do think Disney could do better. I too would not be opposed to having perhaps a single Avatar themed attraction at The Studios (or perhaps even still at Animal Kingdom), and using that plot of land for something else. FYI, the only people hate the idea, including yourself, are a VERY small minority. That’s not the impression I get. A good two thirds of the people I talk to have no love for the Avatar franchise. Considering the other possibilities and recent purchases Disney have made. I and many many (yes the majority) like me think Avatar land is a huge mistake. Also Universal have definitely taken a chunk of Disneys revenue and Disney are worried about appealing to the 13+ crowd. How can you hate something we know 0 about? What people did not like about Avatar is the story, not the world. Its like George Lucas could have had the most cheesy story ever for one of the Star Wars movies (Cough cough episode 2 cough cough) and people would hate the world because of the story. LAY THE DANG STORY ASIDE AND LOOK AT THE WORLD! Im sorry, but investing in a whole land based on a property that will no be flexibly thematically is not very smart. Ten years from now, they will have to change all the buildings, rides, shops and re-theme them. Isn’t it better to have an open idea land where you can add to it without worrying about theme limitations. When they had that “fantasy animal” idea land, now that’s an open concept with endless possibilities. That would be smart for the future. Why can’t they just use the space for a Beastly Kingdom-esque thing. I’d much rather see creatures that have stalked our collective imaginations for centuries then creatures that live in the land of James Cameron’s Ego. Why is everyone so down on Avatarland? Yes the story is cheesy….and extremely predictable….BUT that isn’t what made audiences want to go see the movie over and over again. It was the world that Cameron created. There is so much detail and variety with everything. I remember seeing the movie three times because I just loved being in that world. Despite it being all CGI, it felt real. From the floating mountains to the bioluminescent forests, it was amazing and immersive. THAT is why Disney made the decision, I think. Disney stories are always predictable, they just make them their own. Avatar did the same. As for theming, I say it fits perfectly into what Animal Kingdom stands for. We need to take care of the world around us and appreciate the beauty of it. The overall theme for Avatar is pretty much that. Also, we already have an ancient past area in Animal Kingdom, Dinoland USA, so why not have something otherworldy to balance it out? We also don’t know anything about the project. We also don’t know what is going on behind the scenes. It might be that they can’t break their contract with Cameron without suffering serious losses. At the time of making the contract, Disney might have only started talking to Lucas about owning Star Wars but the Avatarland with Cameron was a more promising deal. We don’t know. I’m all for Avatarland. I think it would be incredible to walk into Pandora and see those alien trees and plants in real life. The ride or rides for the area don’t have to be only a dark ride. We could get a rollercoaster or a mixture of Dark-ride and rollercoaster. I think that this could be a really amazing experience. I think that disney should throw away the avatar idea and add an area dedicated to the oceans and seas of the world, they could have stuff for finding nemo/dory and other stuff as well. They could even put the seas with nemo and friends there instead of epcot! I think it’s a cool idea. Any thoughts? I agree with Timothy Carson. Listen to him and stop saying bad things about projects that we currently know nothing about or have yet to see for ourselves! It is interesting to see the passion with which people discuss Disney (myself included). It is interesting to be told that if you don’t like an idea you don’t belong here, aren’t creative, or are just negative. The simple fact that so many people are not ecstatic about this new land is the exact reason why I feel it is a bad call. Resources are limited and therefore I would like to see them allocated to their best possible use. I, like you, really want Disney to be the state-of-the-art, cutting edge leader in the world’s theme parks. I love Harry Potter and think it is an amazing area and I want Disney to compete with an area that will have longevity and be an international DESTINATION. If they had announced Star Ward land there would have been a largely positive response because Star Wars has legs. I fear Avitar does not. I firmly believe the Imagineers will make Avitarland an amazing addition to Animal Kingdom. I firmly believe it will be stunning. I just wish they were not spending their resources on a property that I feel is derivative and a ripoff and will not be remembered as anything special. Such wise words. To be told this isn’t the place for me unless I agree with Disney 100% is insulting and just because were not imagineers doest mean our opinions are invalid on whether ‘we the people’ will enjoy or share the same bond with an Avatar land as we have with other movie based areas. Does the fact that Avatar was one of the first Mainstream 3D movies not factor into its ratings and popularity at all? If it came out now would it be as popular. If Avatar 2 doesn’t do nearly as well then what? When they build it i am sure i will like it but will i like it as much as i would an Ewok village or a dragon land (still the only animal featured in animal kingdom logo not to feature in park)??? Dances with Smurfs! I am not sure why Avatar was changed to Avitar on my iPhone but I apologize for the typo…. I didn’t think the movie was that great. It was one of the first 3d movies and had awesome visuals. But a whole land? I’m not buying it. I think it works as a one off attraction in a mythical creature land. Those making the star wars to avatar comparison are way off base. That’s like comparing the Yankees and the Toledo MudHens, both professionals but in different leagues. What about Califonia Adventures? The concept wasn’t right from the beginning. Everybody knew it, but nobody was listening. They already had invested numerous millions on it and nobody wanted to admit they were wrong. Now they have to re-do and re-theme the whole park. They could had saved billions of dollars if they had thought about the longevity of the ‘idea”. Ideas are concepts and those concepts have to work and be flexible. I don’t believe people are condemning Avatar or the idea, but they are expressing their concern about the longevity of the investment as well as the long run interest of the concept. I also think Avatar is a bad idea. I think that the Mystical Creatures land that was supposed to be part of Animal Kingdom to begin with would be the correct direction to go. Dueling Dragons at Universal was supposed to be part of that land. The Coaster was a Disney idea. Avatar will not have the following that they think it will. Even Cast that I speak too is very very unhappy about it. The Movie itself was stunning but it is not something that is going to make me want to go to Animal Kingdom. say I really enjoy reading your articles. Can you recommend any other blogs/websites/forums that deal with the same topics? indicators to monitor her financial health on a monthly basis. their business suits, tuxedos and dress shirts. Boxers and the name stuck.